Apr 19, 2016 – LONG BEACH, Calif.
Ryan Eversley found himself deep in the Pirelli World Challenge GT field early after a collision at the start forced the team to repair the hood of the #43, and he was unable to do much about it as the first half of the race was run under caution. But the second half was a different story as Eversley picked his way through the field over the last 10 minutes to finish seventh. Peter Cunningham was close to the top 10 for most of the day after climbing from his 16th-place starting spot, but was spun by an over-optimistic competitor in Turn 6 with less than 10 minutes to run. Undaunted, the seven-time series champion stormed back late and finished a season-best 12th. Eversley’s finish allowed him to climb into the top 10 in the championship standings for the first time this year and marks his fourth top-10 finish in the year’s five PWC events. The continued improvement shown by the RealTime Racing Acuras will be on display again in six short days as the Pirelli World Challenge series heads to Barber Motorsports Park for Rounds 6-7 next weekend. Developed from the production Acura TLX by HPD and RealTime Racing, the Acura TLX GT features HPD chassis and aerodynamic performance parts approved for Pirelli World Challenge competition. It is powered by a direct-injected, twin-turbocharged V6 engine, developed by HPD from the production Acura TLX. Video recaps from this weekend’s Acura Pirelli World Challenge racing activities in Long Beach are being posted on the “Honda Racing/HPD” YouTube channel. Produced by the Carolinas Production Group, the video packages can be found in the 2016 HPD Trackside Video Playlist at: https://www.youtube.com/HondaRacingHPDTV. 3 Patrick Long EFFORT Racing Porsche 911 GT-3 + 18.012 sec. 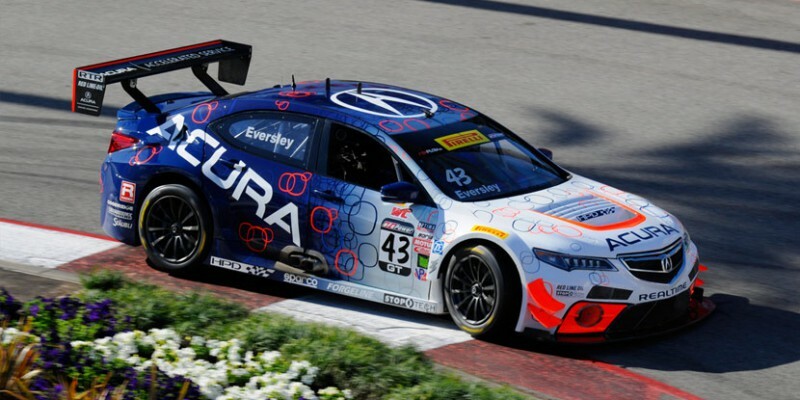 7 Ryan Eversley RealTime Racing Acura TLX GT + 27.842 sec. 12 Peter Cunningham RealTime Racing Acura TLX GT + 67.735 sec.